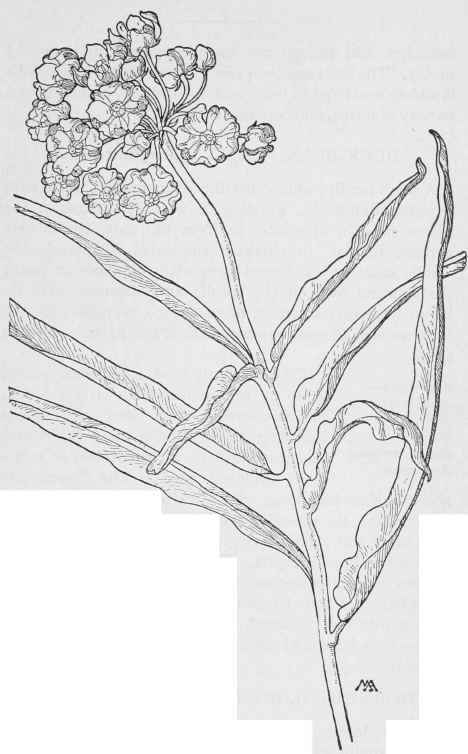 A striking plant, though dull in color, from one to one and a half feet tall, with a rough, rather slanting stem, dull green, roughish, rather leathery leaves, and clusters of slightly sweet-scented, queer-looking flowers, each over half an inch across, with greenish-yellow petals, the hoods white inside and maroon outside, their tips curved in, a green stigma and brown anthers. The effect is a dull-yellow rosette, striped with maroon, curiously symmetrical and stiff in form, suggesting an heraldic "Tudor rose." The pods, three or four inches long, stand up stiffly, on pedicels curved like hooks. This grows on dry hillsides and is widely distributed.